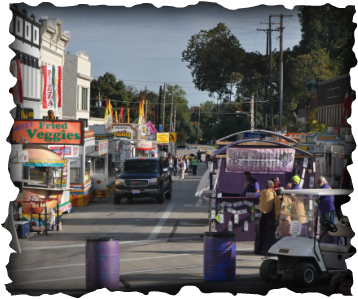 The crossroads of Main Street and Broadway are packed with many vendors Selling many different types of food and refreshments. We limit vendors based upon their product offerings. We do not want to overload our attendees with too many of any one product. Some types of concessions have a waiting list of over FOUR years. However, we are always looking for new and unique offerings. Our concession CHAIRPERSON WOULD LIKE all potential concessionaires to send A request to him in WRITING. ALL INQUIRES must include what products they sell and pictures of their concession stands. FOR MORE INFORMATION ON CONCESSIONS PLEASE CONTACT THE CONCESSIONS CHAIRPERSON.